So you want your garden to look gorgeous, but you’re not sure where to start? Not a problem – we’re on hand to offer some inspiration! TimberTech composite decking is available in a stunning selection of colours, shades and styles, which means that you really can have that picture-perfect deck of your dreams. If you’re bored of your back garden, take a look at the photos below to see what we can do for you! Alternatively, contact TimberTech now to discuss your outdoor deck ideas with one of our experts. 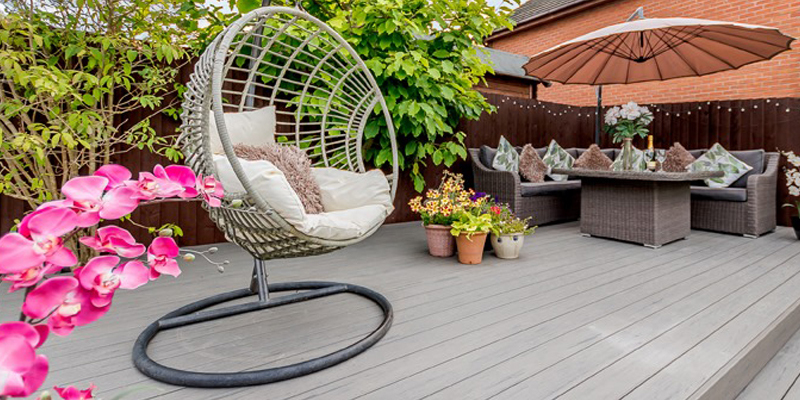 There are all kinds of options to choose from when it comes to furnishing your garden deck. Whether you prioritise style or comfort, you shouldn’t find it hard to create the perfect space for outdoor relaxation. Browse our gallery to see a variety of deck design ideas. Splitting your deck over multiple levels can create a very eye-catching effect indeed. It can also be highly practical: for instance, you could use the upper level of your deck as a general lounging area, with steps leading down to an outdoor dining space on the lower level. Take a look at our ideas gallery for some examples of what a split-level deck can look like. We have two beautiful deck railing products available here at TimberTech: RadianceRail composite railing, and Impression Rail aluminium railing. Both are attractive, low-maintenance options that are great for giving garden decks that picturesque finishing touch. Alternatively, if you’d like to give your deck a more contemporary finish, we also supply a variety of glass balustrade systems that will add safety and visual appeal to your decked area. Take a look at our balustrade gallery for some very modern deck inspiration! Why choose just one decking colour when you could combine two? 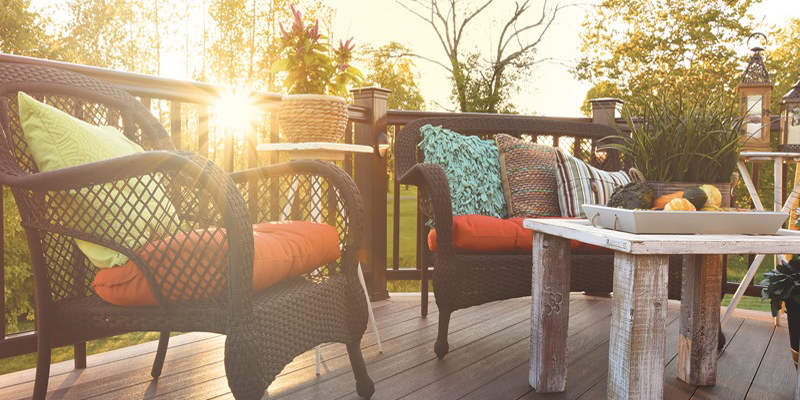 Using contrasting deck boards is a great way to make your outdoor living space unique and attractive – for instance, you might consider using one colour as a bold ‘picture frame’ (border) for the main body of the deck. Click through the photo gallery for more duo-colour deck ideas. Our boards can be used to add a built-in bench into your garden deck! These composite wood benches look great, and they have the same hard-wearing, low-maintenance qualities as our standard decking products. We can also incorporate stylish stairs into your TimberTech deck – ideal if your outdoor living space is spread over multiple levels. We can even incorporate deck lights into the steps for added safety and aesthetic appeal! Order your FREE decking samples to take a closer look at TimberTech’s high-quality deck boards, or contact us now to discuss your deck design ideas with one of our experts.